Apple store in Shanghai, China. 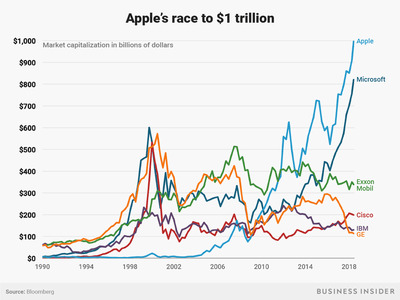 Apple became the first US company worth $US1 trillion on Thursday. Watch Apple’s stock trade in realtime here. Apple’s market cap briefly topped $US1 trillion on Thursday, the first time a US company has ever achieved that feat. It’s been a long slog to the top since the iPhone maker went public at $US22 a share on December 12, 1980. The chart below, which came to our attention via Pension Partners’ Charlie Bilello, shows that the company had to outmaneuver corporate giants like General Electric and Microsoft, which once held the title for most valuable company in the world. The pace of growth in Apple’s market cap really picked up steam in the late-2000s, which coincided with the launch of the first-generation iPhone. 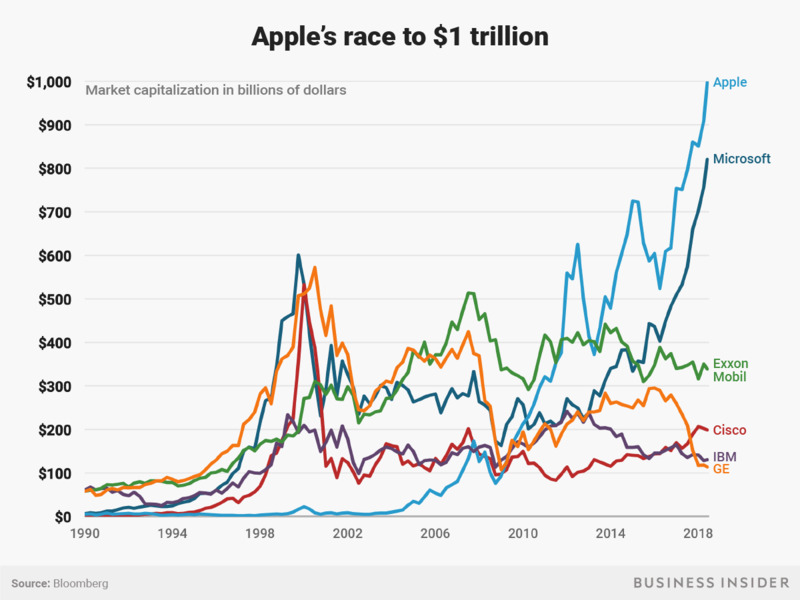 Apple’s rise to a $US1 trillion market cap is also symbolic of the evolution of what kinds of companies are most valued by investors, and society at large. Five of the 10 largest US companies by market cap on Thursday were tech companies, including Amazon,Alphabet, and Facebook. In 2011, Apple was the only tech company in the top five. Investors gave Apple the lift over $US1 trillion after its second-quarter earnings on Tuesday beat Wall Street’s expectations, sending the stock up to the magic price of $US207.05.